As i commemorate world cerebral palsy day, I recall the beautiful smiles and hugs i get when i visit Cerebral Palsy Society of Kenya (CPSK). CPSK is a charitable organization that help those affected with cerebral pasly in Kenya. It is located in doonholm, Nairobi. CPSK create awareness of the disease to the public, offer supportive therapy, medication, education and counselling. CPSK enable promotion of legislative policy and other measures to improve the CP patients welfare. Cerebral Palsy is a neurological disorder caused by a faulty-formation or injury of the brain of a child during pregnancy, giving birth or shortly after birth. It affects body movements through poor muscle co-ordination.Wikipedia states the cause from abnormal development or damage to the parts of the brain that control movement, balance and posture. Though there is no cure for cerebral palsy, the disease is not life threatening thus the children can live up to adult lives. There are supportive treatments, medications and surgery that aid the lives of the children. The supportive treatments consist of physical therapy, occupational therapy, and speech therapy. Cerebral Palsy is partly preventable by avoiding head injuries in children and care of pregnant mothers. 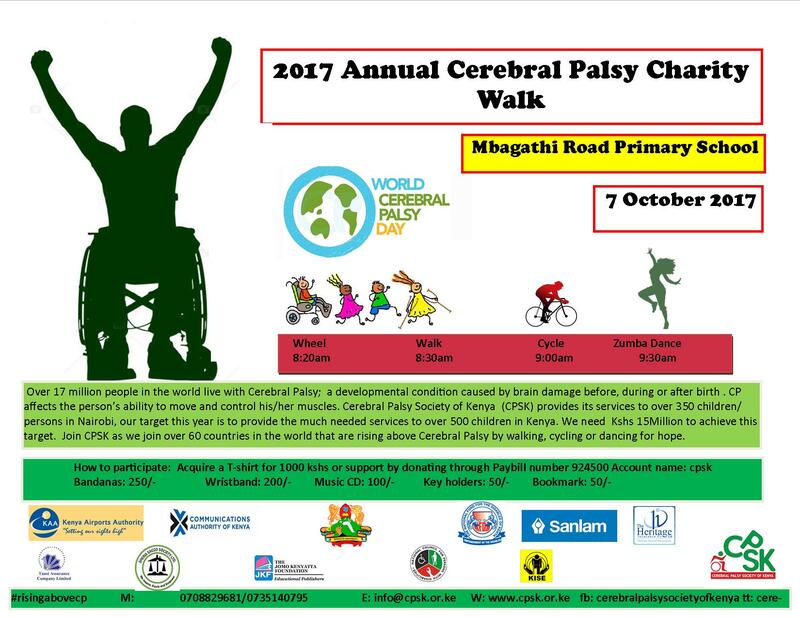 CPSK has organized a 10km charity walk to commemorate world’s cerebral palsy day . It will begin at Mbagathi Road primary School at 8.00 a.m tomorrow on Saturday 7th October, 2017. I hope to see you there fully geared to walk with the children, parents and care-givers to support in raising funds to aid more patients in Kenya and the world. With oneness of our Kenyan spirit, Kshs. 15,000,000 will be achieved and more patients will benefit from your and my help.